New York Avenue is a juggernaut of a thoroughfare. At its western end, the Treasury Department and just beyond, the White House. At its eastern end, US-50 and the road to Annapolis and points east. In between, it is an unmatched artery for vehicle transportation throughout the city. Over the last year, it’s undergone some serious construction projects, and things are about to get a whole lot more complicated for the road, and those who commute along it. 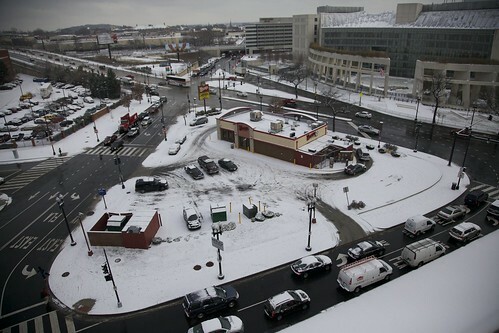 This summer, Dave Thomas Circle (pictured above) underwent a traffic reshaping project, wherein the frustrating intersection at New York Ave and Florida Ave near the ATF building was reshaped to allow for better traffic flow, a project that DDOT considers a significant success. They’re about to do something, though, that will lead to a lot of commuter frustration. Starting in 2011, DDOT is going to spend three years rehabilitating the New York Avenue bridge over the WMATA and Amtrak tracks just beyond Dave Thomas Circle, which will take the six lane bridge down to five lanes and then four lanes for a full year. During the worst of that time, DDOT will be offering a $50/mo alternate transportation subsidy that up to 2,000 affected commuters will be eligible for. DDOT will be collecting information for those applicants in 2011 and we’ll have more about that information when it’s been formally announced. Phase 1 of this project is due to start in January and will require the bridge be closed to pedestrian traffic with a four block detour necessary, and a single lane will be closed moving the bridge to 5 lanes. That phase is expected to last until the end of summer in 2011, when Phase 2 starts. Phase 2 and Phase 3, each a year in length, will require the bridge to be condensed to 2 lanes in each direction. In addition, demolition of the old 9th street span is scheduled to begin this winter, which is necessary to build the new exit ramps to 9th Street and the Brentwood Parkway. The new bridge span is finished (and quite lovely, I may add!) but is undergoing finalization now, which includes some milling and resurfacing work at the termination points. It will be 2013 before the work that’s about to start is finished, and numerous headaches are surely coming as the main thoroughfare for eastern egress from the District undergoes a much-needed facelift. There will be posted detours and alternate routes, when DDOT launches their planned new website FixingNewYorkAve.org later this winter. “WMATA and CSX tracks” should be “Amtrak, WMATA and CSX tracks”. Does Amtrak own that particular section of those? I had thought that they were leasing time from CSX there. Well, so much for using that route for the next three years. I realize it’s needed, but NY Ave is never an easy route to take. I still remember all the road work from the late 90s; THAT was a fustercluck. And it sounds like those days have returned. No, Amtrak owns the electrified tracks all the way into Union Station. In fact, the more I think about it, CSX doesn’t own any of the tracks under that bridge – it’s just Amtrak and CSX. CSX only owns the tracks that make the U-turn and go under the Brentwood Parkway. Is there a good map somewhere for track ownership? Thanks much to IMGoph who passed along this handy reference which shows the tracks do belong to Amtrak, MARC and WMATA. The CSX tracks are near there, but do not pass beneath the bridge. That is an excellent map, good find! MARC doesn’t actually own any track, (nor do they operate any trains) they contract with Amtrak and CSX to operate trains on the tracks that they own. The Orange colored tracks actually belong to the Washington Terminal Company – WCT was jointly owned by the B&O and Pennsylvania railroads (since they used those tracks jointly in the pre-Amtrak era. Since 1981 the WCT has been wholly owned and operated by Amtrak. Sorry for all of the chatter on a only tangentially-related topic!